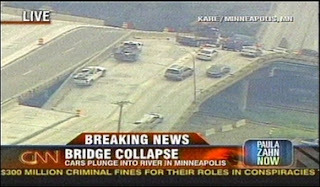 Home » News » How do Minneapolis Minnesota Bridge Falls? 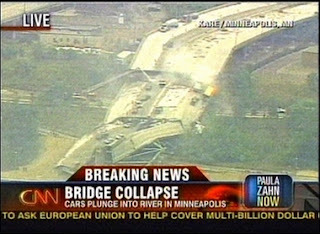 It was shocked reading the news of the bridge collapse this morning. It is rare to happen in a country leading in technology. 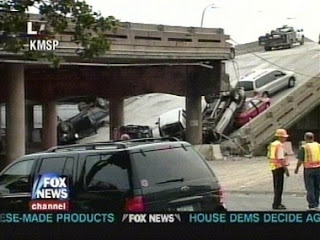 MINNEAPOLIS - The entire span of an interstate bridge suddenly broke into huge sections and collapsed into the Mississippi River during evening bumper-to-bumper traffic Wednesday, sending vehicles, tons of concrete and twisted metal crashing into the water. At least six people died, the mayor said. MINNEAPOLIS (AP) — At least one person died Wednesday and 28 were injured when an interstate bridge collapsed into the Mississippi River during evening rush hour, a hospital doctor said. Dr. Joseph Clinton, emergency medical chief at the Hennepin County Medical Center, said among the injured treated by the hospital, six were in critical condition. Clinton said it appeared the person who died had drowned in the collapse. Other area hospitals were also seeing victims. 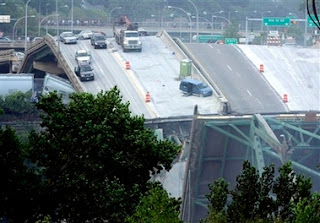 The Interstate 35W bridge, a major link between Minneapolis and St. Paul, was in the midst of being repaired when it broke into several huge sections during rush hour.